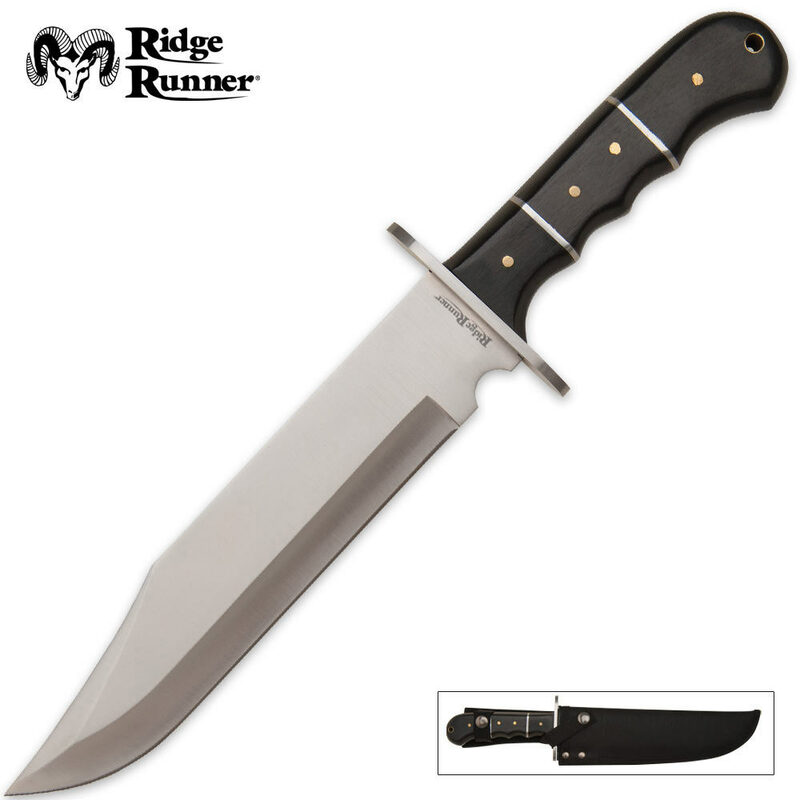 Ridge Runner Coyote Run Bowie With Sheath | BUDK.com - Knives & Swords At The Lowest Prices! This elegant Coyote Run Bowie knife is from Ridge Runner® both attractive and functional, with its AUS-6 full-tang, stainless steel construction. The 8 1/2" blade is completed by a handsome guard and inlaid pakkawood handle with brass colored pins. I own several RR knives and have been pleased with them all. This bowie is no exception, especially with the BOGO sale. Mine came very sharp and very tightly put together...it's a lot of good steel for only $7.00 each. Absolutely looks and feels like a much more expensive knife. got this knife it was very sharp and handle is excellent,all around great knife for every day use.thank you budk for a good knife at a low price. This bargain is really a "Wow!" for strength, full tang, nylon sheath! As great as my Timber Wolf knife (TR65), but, a bit lighter! Made in China, and anything even close to this quality from others would cost many times more! Mine are 137/8ths long, with an 8-11/16ths inch blade. The edge is the first 7 -1/2 inch of the blade. About perfect for hunting, and camp use, Handle stainless separators are a tiny bit chipped on the finger wrap sides, but, I won't part with mine! Makes great gifts, if you can bear to part with! I have ordered a bunch of these now on the everyday bogo offer. They are super work/survival knives. Really good steel. Fit & finish of the handle varies and is not "showy" but solid. The finger groves and hold over on the blade make for a sure and comfortable grip. The sheath is great because it has a solid plastic insert which keeps the sharp edges from damaging the nylon. The sheath could use a lanyard hole at the tip for lashing to users leg. Overall an unbeatable value. Thanks Clint!!! What a bargain! BOGO an 30% off? Less than $6 for a great knife. Full tang construction! i had been using one of the timber rattler bowie knifes and i lost it (dang it) so i purchased a couple of these coyotebowie now i did love the heavyweight timber rattler , but wow this coyote bowie is pretty nice , considerably lighter than my old rattler this knife is sturdy . plastic ear tags , hay string . feed bags , string trimmer line . most anything on my farm . the nylon sheath is triple riveted and light as a feather . i routinely kill 4 to 6 knifes a year and this knife is tough . at less than 15.00 you'd be hard pressed to find a better knife at that price point . you'll be impressed . I found this Bowie to be a solid, strong, Bowie and should hold up to about any reasonable task given to it. The fit and finish on the grip was a bit rough leaving burrs that were sharp and will take time to carefully de-burr without damaging the panel grips - it's made in China! Four stars because of the rough finish however it does not take away from function. In the picture it shows only one brass rivet at the back-end of the handle grips - mine had two. Also, if you like nylon over leather this knife comes with a very durable nylon sheath with plastic liner and should last many years of hard use and with a Bowie of this size, that means a lot! Happy trails. Had to come back and review this knife again after using it for over a year. This knife is extremely well made for the price. The only problem ive had with the knife is that the hand guard had a spot-weld break after i had been throwing it for a period of time. To fix the sleight wobble of the guard i took off the handle and welded the guard all the way around. This Knife is now perfect. The handle has some chips out of the wood, but i dont baby this knife, i throw it, i chop with it, i baton with it, i cut, carve, skin and gut with it, and it keeps asking for more. Mind you i am out in the field around 9 or more days out of a month, and ive had this knife with me for a year, so it has saw at least 100 days of hard work and play, and other than the hand guard wobble (witch i fixed easily), and normal wear and tear on a wood handle, it has done its job and then some flawlessly. Take it from experience, this knife is more than worth the money, and i wish BUDK still sold them. I received my knife very quickly and as soon as I opened the large box, I was surprised by how large it is. The knife is absolutely beautiful and very well made. It had some oil from the manufacturing, but a little WD40 on a rag and it shines! I could not ask for more. If you are on the fence about ordering one, I promise you will not be disappointed. Sharp, heavy, large... What more could you want from a bowie!!! My replacement came to me with a little coat of what looked like sprayed on glue, and I went to the Dollar Tree and purchased a bottle of Goo Gone for a dollar, and used about a teaspoon of it on an old bath towel that I cut into pieces and rubbed the whole knife and handle with it, as the Goo Gone is for general purpose removal of any adhesive. After I finished wiping it down, it looks like a new penny, shiny, and clean. Then after about 10 minutes with my sharpening kit you can shave hair from your arm with it. This is good steel for what I paid for it, and I cut a 2by4 in half with it in 3 whacks. Just wanted to let anybody that gets one with some glue, or spots on it get some Goo Gone and you will have a very nice bowie to show people without having to spend a lot of money for. I highly recommend this one!